Pope Pius IX - freemason? While the author of this article in 1922 was convinced that Pius IX was a freemason, and other reports are available, it should also be noted that this website is not privy to Italian masonic records and cannot testify to their veracity. But, strange to say, there is no doubt that Pope Pius IX. was himself a Freemason. His signature still exists in the books of one of the Italian Lodges of Monte Video. 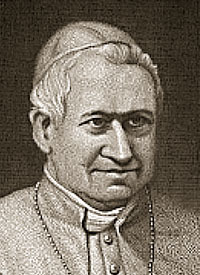 Shortly after his ordination Mastai Ferretti (which was his secular name) was sent as Auditor to the Vicar-General of Chile, and at one time it was believed that he was initiated into Freemasonry in that country. When, in later years, he was appointed Apostolic Delegate in Uruguay he appeared in the Lodges as a fully qualified Freemason, and a writer in the Libertad del Pensamiento, a Madrid journal, in 1870, said that there was in existence in the possession of one whose name he gave (Soussingeas) a portrait of the Pope in Masonic regalia. "Orient of Nuremburg, Lodge of Germanic Loyalty, daughter of the Grand Lodge of Bavaria, working under constitutions emanating from the Grand Mother Lodge of the Three Globes of Berlin. "'We, Master Masons, dignitaries and officials of the third degree of Masonry of St John, certify in the name of the Supreme Master, who directs all, that on this, the date given below, at the hour of twelve at night, we have received in this Lodge in the form prescribed by our rituals, and with entire conformity to our constitution, the Brother Giovanni Ferretti Mastai, a native of the Pontifical States, who, having assumed the oath in the presence of all of us, declared that he did not belong to any secret society hostile to this Lodge, and who has paid the charges demanded of him. "'Wherefore we call upon all the Masonic Lodges of the world to recognise him and hold him as a genuine and true Mason, received in a just and perfect Lodge, and thus we regard and certify him, as a conscientious and honourable man. "'In testimony of the entire truth of the present document, we sign in Palermo, in the profane and civil year 1839, on the fifteenth day of the month of August. "'Ne varietur : Giovanni Ferretti Mastai. "'Matteo Chiava, Master of the Lodge. "'Paolo Duplessi, Secretary of the Lodge.
" I certify to the truth of the foregoing, and that our archives contain the above document under the number indicated.
" Wilhelm von Wittelsburg, Grand Master of the Grand Lodge of Bavaria, Prince of Bavaria." " The charges against him were first prepared in his Lodge at Palermo in 1865, and notification and copy thereof sent to him, with a request to attend the Lodge for the purpose of answering the same. To this he made no reply, and for divers reasons the charges were not pressed until he urged the Bishops of Brazil to act aggressively towards the Freemasons. Then they were pressed, and, after a regular trial, a decree of expulsion was entered and published, the same being signed by Victor Emmanuel, King of Italy, and the Grand Master of the Orient of Italy." The king thus returned his compliments for the "major excommunication" which the Pope had sent him a few years previously with the Popes kind regards." "It is difficult," said the Pall Mall Gazette in October 1874, "to see what retort Pius IX. can make to this decree, unless, indeed, he has in reserve some still more formidable maledictory missile to launch at the Grand Lodge of the Orient. But in these days, unfortunately, a papal anathema is hardly as terrible as a Masonic decree." Dudley Wright, Roman Catholicism and Freemasonry. London : William Rider & Son, Limited, 1922. hc. 251 p. 5 3/4" x 8 3/4". pp. 172-175.